Back in early March we asked Stogie Guys Nation, “What do you really want to know about cigars?” You responded with a wave of interesting questions, many of which were used to create questionnaires that will be distributed to various leading figures in the cigar industry. Today you’ll finally get some answers. In the first part of our Ask a Cigar Insider series, John Sullivan – manager of the JR Cigar store in Washington, DC – discusses famous clientèle, favorite smokes, cigar aging, and more. SG: Who’s the most interesting person to visit your store? Can you tell us a bit about your customers? JS: We have many interesting people come into the store. Some are famous some are not. But they all love cigars. We have been visited by Jake Lamotta (The Raging Bull) and Gerry Cooney. Sen. Fred Thompson used to come in. Ambassador Joseph Wilson and Rep. Tom Delay, but not at the same time. 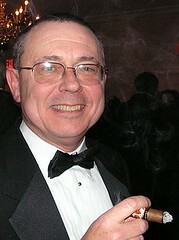 The former DC Mayor Tony Williams came in all the time, that is until his cigar smoking became politically incorrect. The best thing about this store is when someone comes in the only label they wear is “cigar smoker.” We have university presidents talking with truck drivers. People meet and talk across all sorts of social divides. SG: If you could only smoke one specific cigar for the rest of your life, what would it be and why? JS: I know it may seem odd but the cigar I would pick is the JR Ultimate Petite Corona Double Maduro. Just the right size to enjoy and not last too long. The maduro wrapper is a bit sweet, and this cigar can be smoked any time of day. It comes in a nice cedar box and…well, enough said. I think I’ll have one now. SG: Conversely, what specific cigar are you surprised people keep buying? JS: What a tough question. A “good” cigar is a cigar you like, so to pick one that’s “bad” is only a result of personal taste. But, if you must know, I personally dislike Onyx. I think it’s a cigar that doesn’t live up to it’s reputation. For a company that’s supposed to be a maduro specialist, Onyx smokes dry and too woody for my taste. No sweetness at all. But we sell the cigar at a decent rate. So again, a “bad” or “good” cigar is a personal decision. SG: In your personal humidor(s), do you keep the cellophane on or off? Why? JS: I do both. I have to admit my humidor is a collection of various cigars from a wide range of wrappers and blends. I keep the cello on to help protect the individual cigar from blending in taste with the one next to it. I should keep them separate, but I take care of my store much better than my personal humidor. SG: Are you a believer that cigars get better with age? What affect do you think aging has on cigars? JS: This question kind of goes with the cello question. I do think cigars get better with age, but only to a point. I think that when a cigar is bought it should be placed in a humidor for a period of time. This allows the cigar to pick up some moisture, and will ultimately make it much more enjoyable. Keeping cigars in a cedar-lined humidor helps them blend the different leafs into one taste. In this case, if it’s all the same cigar or blend, take the cello off to allow the effects of humidity and cedar to infiltrate the cigar. Cigars sometimes come to my store that are still too young to smoke. There is an ammonia taste. This means the tobacco has not yet aged enough. Many thanks to John Sullivan for taking the time to answer our questions. For all you DC-area Stogie Guys out there, be sure to visit his JR Cigar store at 1730 L Street, NW. Very interesting interview! Good job. I found it telling that w/ only ONE cigar to smoke for the rest of his life, he chose "JR Ultimate Petite Corona Double Maduro". Not the Opux X, Padron 1964, Montecristo Habana….nope. The JR ultimate. Nice interview Patrick. I agree with him on those Onyx, I've never been real impressed with them. Wow, Dicksbain, why don't you tell us how you really feel about JR? Personally, I've had a pretty good experience with the company, and I think their JR Alternatives turn into really good smokes (especially for the price) after you hold onto them for over six months. Don't you think it is possible that he actually really likes the JR Ultimate? If he had said JR Alternatives then I would think he is full of BS, but the JR Ultimates are $4-6 cigars – and considering that you aren't paying for the marketing that goes with most "premium smokes, it's probably fair to say they are comparable (at least $$ wise) to something that might run you almost 10 bucks. Cool interview, Guys. BTW, I'm with Mac and Padronnie on this one. While I agree with Dicksbain that JR is no longer the best of the online merchants, bashing the JR Ultimate Petite DM as a throwaway is a stretch. In my experience (a couple of boxes worth), it's an awfully good smoke at a fair price point. A heap of flavor in a small package. Compares favorably to any other house brand under the sun. It might not be my "desert island smoke," but Mr. Sullivan's choice didn't strike me as absurd, either, particuarly if bang for the buck is a consideration. The question was "If you could only smoke one specific cigar for the rest of your life, what would it be and why?" It wasn't "Name a good cigar" or "What's your favorite smoke" or "If you wanted a bargain cigar, what would it be". The JR Ultimate aren't bad, but their still "seconds". I'd be curious to hear some others answer this question. Personally, I'd have to go with the Padron 1964 Anniversary Imperial Natural. After reading this lively comment thread I thought I'd give my opinion, for what that's worth. Dicksbain, I do agree that my choice for the one cigar I'd smoke for the rest of my life wouldn't be a JR Ultimate. But I don't think it is accurate to call the JR Ultimate a "factory second." It is just JR's brand (and it can be bought elsewhere too, like at Holts) like a Nat Sherman – which also isn't a "second." In fact, if you do want to get a "second" of the JR Ultimate you can buy Consuegras from JR and they'll either be seconds of the JR Ultimate, Rey del Mundo or Hoyo. As for my choice, I'd probably go with a Davidoff. The Millenium Blend if I never wanted to smoke a cigar before noon again, or a Grand Cru for an all day cigar. Then again I might go with something from that island south of Miami. As I understand the question it was "one specific cigar for the rest of your life"… not "what specific FREE cigar"! I'd hate to have to pay $8-10 for my cigar, especially since I smoke 3-5 a day, for the next 30 years. JR Ultimates are a fine cigar for the price. I favor their Cabinet selection myself. Medium-full, spicey and smooth. Elitest smokers and elitest wine drinkers have much in common. If it's not pricey, hyped and hard to get, it must be bad! I applaud Mr. Sullivan for keeping in touch with the "everyman"! Surprisingly, I here a lot of name dropping regarding which cigar to smoke for the rest of ones life, without mention of Corojo? Any Corojo smokers in the audience? I find them well… almost addicting. Personally, I enjoy Bidwell Blend Cafe Corojo- Robustos and Illusione- 888 from Nicaragua. JR Ultimate, Toro, EMS wrapper. My favorite cigar, period. Can’t beat the price and in general the whole package. To me the fun of cigar smoking is finding the cheapest, best smoking cigar. Not spending extra for labels, marketing, etc. Besides…the rantings of Lou in the JR catalog are fantastic reading when you’re sitting on the can! That first guy who said JR cigars are dry and our customer service stinks is obviously an envious retailer. We have the largest and most scientifically designed humidor on earth. If anything people complain that our cigars are too moist when delivered. As for John's selection: that's his favorite. Mine is a Don Diego Privada #4 and I don't own the Don Diego brand, I just like 'em. OPusX? a great cigar, but I couldn't smoke it all the time just as I couldn't eat Lobster Tails for every meal. If I had to pick one meal for the rest of my like, I guess it would be a hamburger or a hot dog… not exactly haut cuisine. I preferred JR's when Lew owned them. He provided far better specials than Altadis does. That being said, I purchased a couple of 5-packs of the JR Ultimate Toro of the Oscuro variety. I am eager to give them a try.